During the 1930s, the Japanese Army was fighting over vast areas of China, and so experienced a wide range of climates. When they attacked the USA and the European powers in late 1941, they quickly overran large areas of the Pacific, and from this point on the majority of their campaigns would be in hot climates, where the tropical uniform would be the norm. Of the many sets of Japanese infantry already made for this era, some have worn tunics and some have been in tropical shirt sleeves (listed below), so this specifically tropical set from Strelets joins a market already quite well-served. As the title promises, all these men wear the same basic uniform, which is tropical three-quarter sleeve fall-collar shirt and shorts. Also common to most are the puttees on the lower legs held by a strap, but one man has a diagonal pattern engraved here, which suggests perhaps socks instead. Many wear standard army boots, but some have the tabi type shoes, with the separate big toe, which were seen in combat. Almost all the men wear the soft field cap, all of which have the cloth sun curtain attached. Apart from one man, who has a one-piece cloth curtain and so may be improvised, the rest have been given this curtain as three pieces, with a 'double' piece at the back, which is wrong as it should be four pieces. Over this some are wearing the type 92 helmet, the standard helmet for all but the very early years of the China campaign, including netting for applying camouflage, and a couple have the cork sun helmet. The Japanese uniform was well designed for the tropical climate, and has been faithfully reproduced here apart from the cap sun curtains. In reality major supply difficulties meant the men often had to make do with locally made clothing, especially on the more remote Pacific islands, so the look of these men was notoriously shabby after a long campaign. That aside, these figures are accurately clothed. The equipment these men carry, which was also subject to poor supply and improvisation, is a mixture of good and bad on these figures. All the riflemen have the twin pouches on the front of their waist belts, but no one has the similar ammunition pouch on the back of the belt, which is a shame as it was common. The three men with the submachine gun have suitable pouches for that weapon, and the man holding the light machine gun (last figure in row two) has a single pouch which holds the tools for his weapon, but no ammunition, which was often left for others to carry so is fine. He does have a holstered pistol for self-defence, which is correct, as does the sniper next to him and the officer in the bottom row. The man holding the grenade has acquired an extra belt of ammunition, and the man next to the officer is wearing his gasmask bag in the alert position on his chest, a highly unusual practice as it was evident to both sides that gas would not be used. Everyone has a water bottle in its carrier, and most also have a haversack, which on some has slipped round the back, presumably to make it easier to sculpt as this is not an ideal position. Lastly many have a bayonet, and some a machete in its sheaf. Surprisingly several have a full pack, but others have the soft bag wrapped round their back, which is a much more likely item when in combat. Apart from the missing reserve ammunition pouch for the riflemen, everything here is authentic. Although she had made incredible progress since 1854, in the 1930s Japan was still a relatively small nation with limited resources and modest industrial capacity. This would be apparent in some of the Army weapons, which were good but did not keep up with the rapid advances being made in Allied weaponry, and certainly could not be made in anything like the quantities required. The basic rifle, the Arisaka Type 38, was a fair rifle, and is presumably what seven of these poses are holding, though detail is not good enough to be sure. One man (middle row) has a telescopic sight attached, and has gone some way to disguise his rifle, as a sniper would. The only Japanese submachine gun of the War was the Type 100, based on the German MP28. 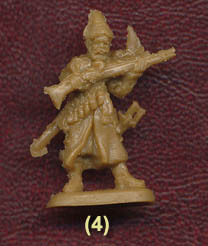 This is presumably what three of these figures are carrying, though it is not a good model and in particular it has been given a straight rather than a curved magazine, since a curved one would not have been possible on two of the moulds. However even these weapons were rare, so we were very surprised to see so many in this set. Apart from the officer, who holds a pistol and also carries a sword, that leaves the last man in the second row, who handles what looks to be the Type 99 light machine gun. This weapon, which traced its ancestry back to the Czech ZB26 (as did the British Bren gun, hence the similarity), is a good choice, and in fact is much the same as its predecessor, the Type 96, but this one has a flash suppressor. With such a minor difference at this scale, the model could pass for either, and both were used to the end of the War. Finally, several men carry a machete, which was for advancing through dense vegetation, but if necessary could be used as a weapon too. The poses are fairly standard but quite lively and generally useful. The man firing his submachine gun over his head is much too flat, so while the idea is OK the figure is almost impossible to reproduce in reality, certainly with any hope of squeezing the trigger, and so poorly done. We wondered too at the advisability of firing the light machine gun from the shoulder. It was meant to be fired using the bipod and even the monopod, and this would certainly have been more effective than firing on the move like this. Perhaps on occasion it was fired this way, though surely not without much discomfort to the man, but a more conventional, if less dramatic, version of the pose would have been better in our view. Equally the man waving his machete in the air may look dramatic but is hardly typical of infantry in combat, so something of a waste, and we were not much taken by the officer pose, with pistol drawn and legs bowed, though at least he has not drawn his sword! The sculpting is typical Strelets, with the trademark rather chunky appearance and certain smaller items being somewhat exaggerated in size. Very small details such as would help identify the weapons are not there, though for the most part these are quite well detailed. There is no assembly, and no flash or extra plastic, so a good job has been made with the mould. We liked the camouflage placed on some of the figures, and on the whole we liked the set too. A couple of small issues with accuracy, and a handful of poses that we would not have chosen if he had had a say, do little to spoil a fairly decent Strelets set.